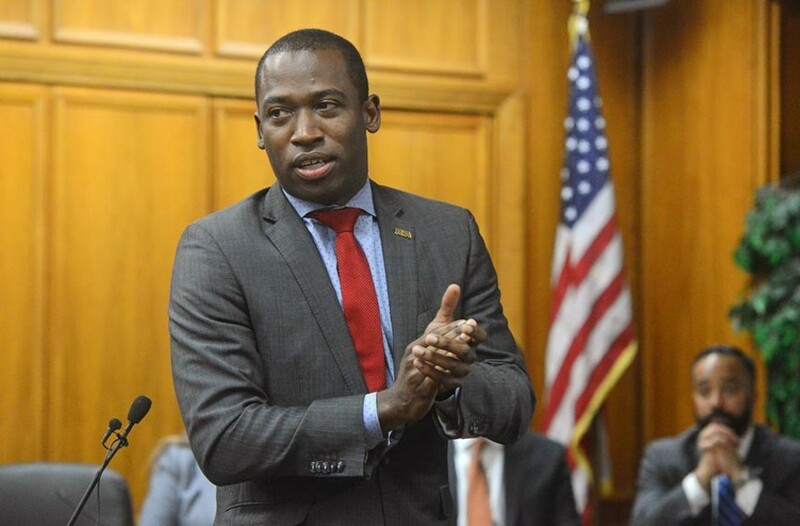 Interview: Richmond Mayor Levar Stoney Discusses His First 100 Days in Office | News and Features | Style Weekly - Richmond, VA local news, arts, and events. Scott Emquist Richmond Mayor Levar Stoney, speaking during a Richmond School Board meeting, turned 36 during his first 100 days in office. Last year at this time, Levar Stoney was resigning from his job as secretary of the commonwealth under Gov. Terry McAuliffe, preparing to enter the already crowded mayoral race. This week, the 36-year-old marks the first 100 days of his first elected office. With budget season and a hectic schedule underway, the mayor took time with Style to reflect on the job -- and to look beyond the honeymoon. Style: This is your first elected office. What’s been most surprising about the job? Stoney: Nothing I would say is surprising. I worked a number of years behind the scenes in politics and government. I got to see the governor firsthand, how he handled his job as a first-time elected official. I’m still surprised by the amount of time it takes to get things done sometimes, the slowness of government. State government was a little bit faster, and city government is a couple notches underneath that. But that’s something you can change. And we’re already seeing some changes in terms of things happening a whole lot quicker than they normally happen. I’ve been to a number of different departments and visited a number of different agencies, schools, fire stations, and community walk-throughs with City Council folks. It’s been fun, busy. I’ve set the pace pretty -- to use an Oregon Trail reference -- we’re at a strenuous pace. Jim Nolan, the mayor’s spokesman: Oregon Trail? Stoney: You don’t know Oregon Trail? You get to set the pace at the beginning of the game. I always put it to strenuous, which means it’s like a breakneck speed. And now I’ve selected a strenuous pace for my office and for City Hall. We’re fording the river. How closely do you follow discussions about the budget you put forward in March? I’m following it very closely. I’ve had a number of sit-downs with members of the City Council. And I’ve gotten to see the firsthand point of view when I’m walking through some of the districts with them. So my door’s been open. If amendments are made, are you open to ideas that satisfy a larger swath of residents, especially concerning the proposed trash, bulk and leaf collection changes? I went down to Kristen Larson’s [4th District meeting] at Huguenot High School and I knew I was going into a rough crowd -- people who are not for my recommendations on leaf collection [eliminating vacuumed leaf service and making bagging leaves mandatory]. I heard people out, and what I told them was: Either we’re going to be a part of the solution or we’re going to be part of the problem. I prefer to be part of the solution. People can sit here all day and complain about the challenges of the city. But what I don’t hear enough are about the solutions. If the council people have solutions or better ideas, I’m open to them. To me this is about progress, about the fix. It’s about getting it better. If their idea is better, I definitely will consider it. The education compact is a fairly high-level document on collaboration. What do you say to parents and community members showing up to public meetings about it with more specific concerns, wanting to know when they could talk about what’s happening on the ground and next steps? Well first, I’m glad to hear folks are ready for the next step. I believe that the education compact is going to be a win for Richmond, a win for parents and a win for children. It’s going to be a win for education. I’m just as excited to hear about the next steps as well, but we’ve got to ensure that parents and residents have a say in the process. It can’t be a top-down document. It has to be something that folks can feel and grab and be comfortable with. At the end of the day, this should be able to chart the course on how we treat public education in the city of Richmond. And what parents and residents are finding out is that it takes more than just one entity -- more than just Richmond Public Schools and the School Board. It takes Richmond City Council and the mayor’s office being on the same page on public education. When I ran for office, I talked about how the mayor can be the grand convener, bringing everyone around the table to focus on children in the city. The compact is just one of the vehicles. With regard to community wealth building, schools and transit: Have you made any headway toward promoting regional cooperation on those topics? I wanted to set the example on regionalism here in RVA, and that’s why I accepted the role of co-chair of Capital Region Collaborative. I’ve traveled to Henrico, I’ve traveled to Chesterfield, I’ve traveled to Hanover. We’ve had conversations about transportation. We’ve had conversations about community wealth building. The operative word there is conversations. They all realize that we work together pretty well operationally. If they need any backup help on public safety, if they need any help when it comes to public utilities or anything of that sort, we’ve got their back and they’ve got our back. But we all understand that we face similar challenges in certain localities and that we should be focused on those -- the big ideas, the big challenges -- not focused on the little thing that sometimes end up dividing us. We’ve talked about what we’ve agreed with, and we’ve talked about what we may disagree with. I don’t see the world 100 percent the same way that maybe my friends in Henrico or Chesterfield may, but at the end of the day we all understand that, you know what, we’re in this together. One Richmond, one region. You went to Mosby Middle School where two teens were shot and killed recently. Tell me about your and Richmond Police Chief Alfred Durham’s plans to reduce the increase in gun violence. I’ve had a number of conversations with Chief Durham about the spike in violent crime in the city. And it’s unfortunate that the spike in violent crime happens to occur in areas of the city that are experiencing deep poverty. It bothers me. It should trouble everyone. When a family in this city loses a child, loses a loved one, the city loses a little bit, too. And the chief and I have had conversations about how we ensure that communities like Mosby are just as safe as communities like Westover Hills. And that does involve more than just the police doing their part. We’re going to do our part to ensure that they get the resources necessary to recruit and keep the most talented officers right here in the city. That’s why I added $1.3 million to their budget. But this is something that has to be done together, working together with [Richmond Redevelopment and Housing Authority], the residents, Richmond Public Schools ... to ensure that the children of the city are safe. The chief mentioned that he plans to establish a public housing unit that will patrol and be focused on public housing in this city. Because that’s where, when you overlay the map of where the violent crime is happening, they’re happening unfortunately in the areas of public housing. That has to be a priority for us. And let’s talk about guns really quick. When you saw the whole gun-running expedition that happened from here to New York and the gentleman said that it’s easy to purchase a weapon here -- those weapons aren’t all just being sold into hands of people who can legally possess a weapon. They’re being sold in the black market and they’re infiltrating and inundating neighborhoods like Mosby and Creighton and throughout the city of Richmond. And there’s only but so much I can do. I applauded the governor when he said he wanted to bring back one gun a month. I applaud efforts to close the gun show loophole. But again and again and again the people across the street, particularly folks from one particular party, refuse to stand up and protect Richmond’s children, Richmond lives. Speaking of the police chief, were you notified about the Immigration and Customs Enforcements (ICE) raids last week, some of which were in Richmond. Were they told or did they participate in them? I read about it. I was not aware of the ICE raids in Richmond. My directive stands -- that is that we don’t participate in 287g -- that we will not ask people in the city for their immigration status. I will not deputize Richmond police officers to do the job of ICE. I will not allow it. I have no tolerance for intolerance in this city. I don’t want to push people into an underclass or into the shadows of our city. We’re going to be a welcoming city. And if anyone who works for the city of Richmond has a problem with that, they should work somewhere else. There are developments being opposed in East End and North Side. Where will we welcome people when no one wants apartments in their neighborhoods? Well, there are a lot of opportunities. I get that there are some communities that want to continue with their current way of living, or their current way of life. And I’m open to listening to them. However, I think change is good. And growth is good as well -- done in a smart, engaging way that involves the communities. There are opportunities in up-and-coming neighborhoods and opportunities in neighborhoods that have been established for many, many years. I’m open and the City Council is open to hearing their voices. That allows for more people in our city to have a home in new neighborhoods that are established neighborhoods, along with the folks who’ve lived there a number of generations. I’m also going to use my powers as mayor, working with the City Council, to direct the private sector to the sort of neighborhoods that need that sort of investment. I hear our residents loud and clear when it comes to folks not wanting certain developments in their backyard, but also I do believe in smart growth, and it has to be done in an appropriate fashion. It’s the how we involve the voices of our community that matters the most. What do you see as your biggest successes these first 100 days? I thought we handled, compared to other years, the snowstorm very well. We were able to get 80 percent of the roads plowed and cleared in 24 hours, when normally it’s around 40 hours or more. Can we do better? Yes. Will we do better? Yes. But I was pleased with the work of the Department of Public Works. I thought letting the world know that Richmond’s a welcoming city was a success as well, that directive, protecting those who want to live in a city no matter what color they be, what religion they might be, no matter who they may love, everyone has a home in this city. That’s the sort of city I’m proud to be the mayor of. I was happy to see Owens & Minor expand their operation into downtown Richmond, bringing in 300 jobs, as we fill up the Riverfront Plaza. I’m glad we got the ball rolling on the performance review of every single department of City Hall. That was something I promised, talked about daily on the campaign trail. We’re going to get a really, really good idea of what Richmond City Hall is suffering from. And we’re going to take those challenges public. I really was a fan of our budget. I thought the budget wasn’t easy but it was a no nonsense, straightforward budget, laying out some of the challenges the city has faced, how it’s turned a blind eye to some of those challenges, and taken them head on. I’m glad we’re taking on the task of collecting the leaves before the end of the year, and clearing bulk, brush and refuse from the streets in a quicker fashion. It’s something we should do. I want a clean city like everyone else does. And the education compact -- us leading the conversation on institutionalizing collaboration between school board, City Council and the mayor. And I’m glad about the strenuous pace we’ve set for City Hall. I love getting out from behind this desk and seeing Richmond for my own two eyes, day in and day out, looking into children’s eyes and seeing what they’re dealing with in school and at home. When I ran, I said I’d be a champion for children, a champion for our residents, that I would listen and see the problems firsthand. And I think I’m living up to that. Residents respect politicians when they say what they mean and mean what they say. And I know that we won’t be 100-percent perfect on all campaign promises but that will definitely be the goal and that’s what we live under in this office.